The Tarot card for September is Justice. Justice i*s sometimes also known as Lust. 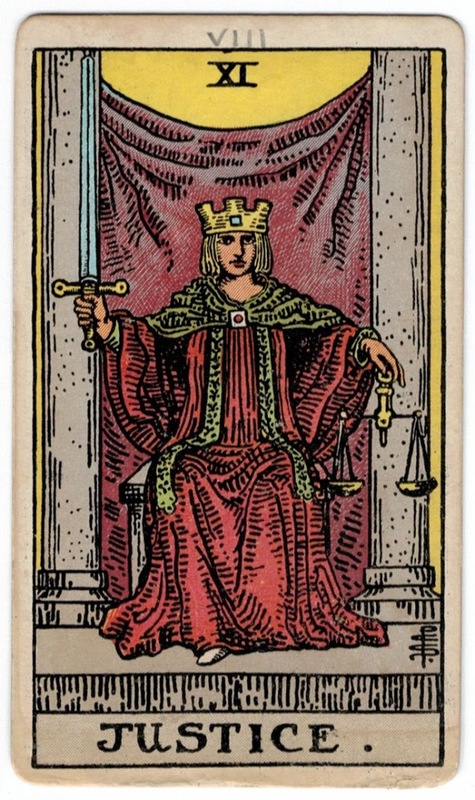 The Justice is the 8th or 11th of the Major Arcana in the Tarot, depending on the style of deck. Justice is associated with the planet Venus, the element Air, the Zodiacal sign of Libra, and the autumnal equinox. 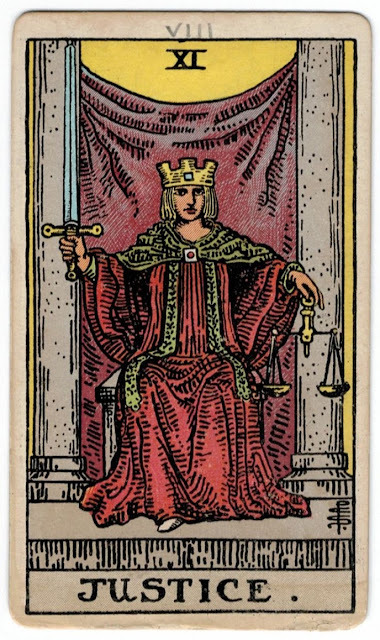 Justice represents courage, fairness, cause and effect, karma, balance and equilibrium, accountability, responsibility, and natural law. This Tarot card reminds us that we are always responsible for our thoughts, words, and actions. The card depicts a person, it may be a man or a woman (depending on the deck), holding a set of scales in his left hand and a sword raised upward in his right hand. Justice is seated in front of a loosely-hung purple veil, and between two pillars. They are clad in red robes with a gold cloak and adorned with a crown emblazoned with a square. The scales represent balance and the sword represents sometimes the necessity to use force to achieve equilibrium. The scales also remind us to balance logic with intuition. The sword is also said to do demonstrate a logical, well-ordered mindset which is necessary to dispense justice. The sword being double-edged reminds us of the consequences of our actions (favorable or not). The purple veil signifies compassion. The pillars signify # and remind me of the High Priestess and the Hierophant. The crown with a square on it represents an ordered mind and discernment.